With the release of 1.3.12 of ONGAA CAM for Biesse, the optional nesting module is now available. The Nesting Option provides the ability to nest complete assemblies at one time. Nesting features include 8 fill/nest options auto nesting, grain alignment, manual moves after auto nesting, tool change / free motion optimization and automatic sheet splitting based on named material and material thickness. 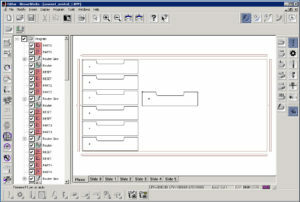 Up to 99 sheets can be nested at one time. 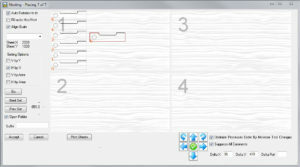 When sheet splitting is used, each material ‘sheet size’ can be selected from a sheet library. Different options can be tried while in preview and once satisfied the layouts can be ‘Accepted’. Printed layout sheets are also available. A nested program is created for each sheet as a standard BPP program. This allows the operator to make ‘on the shop floor’ changes without the need to regenerate the files etc. This is particularly useful when tools need to be changed due to breakage or maintenance. The optimization first interleaves the processes of all the parts to minimize tool changes while still keeping the original order of processes for any one part. The order of the processes with respect to which part will be worked on has been optimized to minimize the total motion of moving between parts. Motions are optimized to favour starting and ending near the machine origin (close to the tool bank).